Queens of the Stone Age have kept their fans inevitably pleased with the release of yet another song from their upcoming new album. And they continue to do it via some incredible, animated videos – “If I Had A Tail” is no exception. The desert-rock band is set to release …Like Clockwork on June 4, and it’s packed with some impressive guest stars. Elton John, Dave Grohl, Mark Lanegan and Trent Reznor, to start, as well as the return of beloved former bassist Nick Oliveri. “If I Had A Tail” is rumored to feature Oliveri, lead singer Josh Homme’s wife, Brody Dalle, and Arctic Monkeys’ Alex Turner. 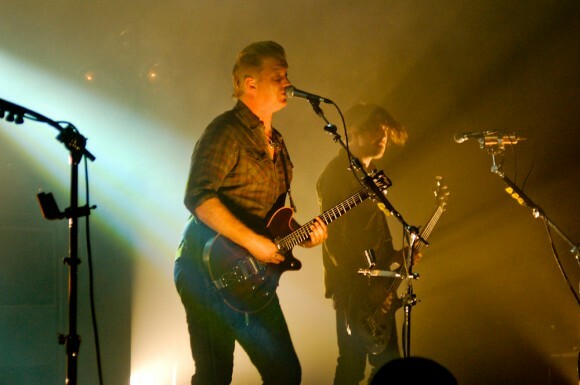 This trio of guests for the song is an impressive collection of QOTSA connections, particularly Oliveri, who was fired from the band circa 2004 and Turner, whom Homme worked with as a producer for the Arctic Monkeys album Humbug. What resulted from the collaboration is a terrific song that both signifies the established QOTSA sound and hints at a new and darker version of the band. …Like Clockwork will be their first album in six years, but anticipation has mounted to gigantic levels thanks to the release of numerous songs and videos from it, thus far. This includes that of the track “My God Is The Sun” and videos for “Keep Your Eyes Peeled”, “Kalopsia” and “I Appear Missing”.